Sanwar Ahmed, better known to the Jackson Heights community as Baul Dada or Jhal Muri Dada has been bringing joy to people through his soulful singing and his jhal muri for over a decade. He has become a local celebrity and has been featured on multiple platforms. He's been featured on Anthony Bourdain's Parts Unknown blog. 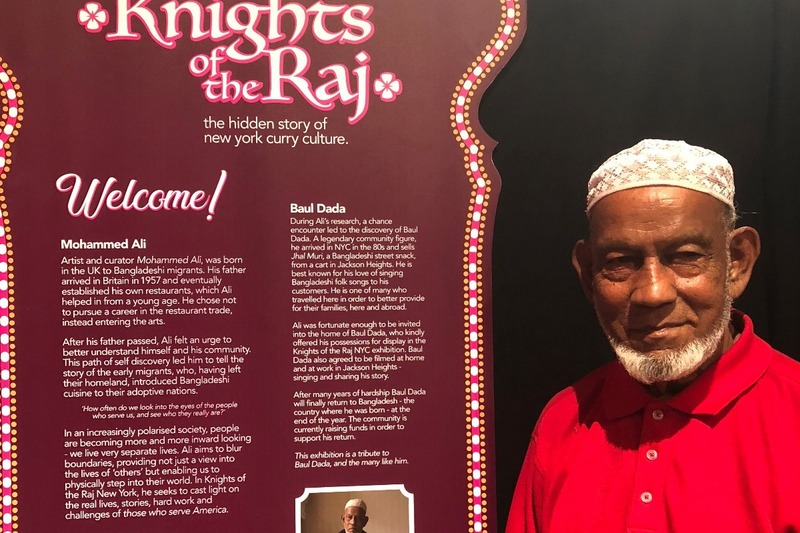 And now, his food cart and his home will be included as an exhibit at the Museum of Food and Drink by the Knights of the Raj NYC and UK artist Mohammed Ali. 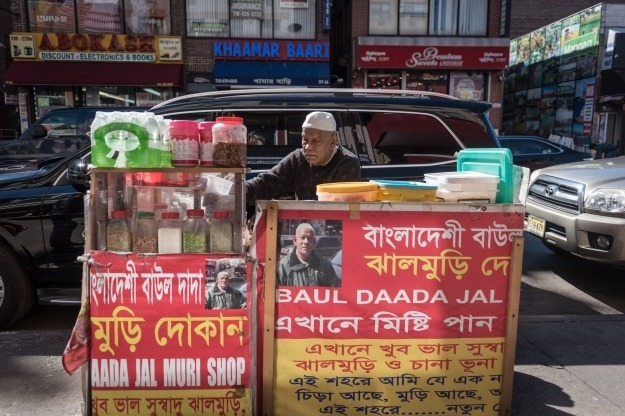 Since 2016, Jhal Muri Dada has also been a part of organizing street vendors in Jackson Heights with DRUM:Desis Rising Up and Moving in response to NYPD's attacks on street vendors. While many know Sanwar Ahmed for his singing and his Jhal Muri, there is something most people don't know. Sanwar Ahmed as been living in NYC for 38 years as an undocumented immigrant. For 38 years he has been living and working here alone so that he can support his family back in Bangladesh. And in all this time he hasn't been able to see his wife, his 2 daughters and 2 sons. While he's been away from his family, he has lost his youngest son and one of his son in-law. So after 38 years and at the age of 89, he has decided to return home to be with his family in his last years of life. But to do so, he needs our support with the travel expenses and getting settled back home with his family. For 38 years Jhal Muri Dada has been a part of our community bringing us joy. Now it's our turn to do something for our Jhal Muri Dada. So if you've ever enjoyed his singing or his Jhal Muri, please consider donating what you can to support Jhal Muri Dada. Thanks to all of your amazing support and a very generous donation from an anonymous supporter, WE'RE ONLY $650 AWAY FROM OUR GOAL! Let's keep it going and meet that goal! Keep sharing and keep urging folks to donate! While we've been fundraising online, Jhal Muri Dada has had a very eventful last few weeks. He was also awarded at the Chatpati Mela in Jackson Heights for his contribution to the community. 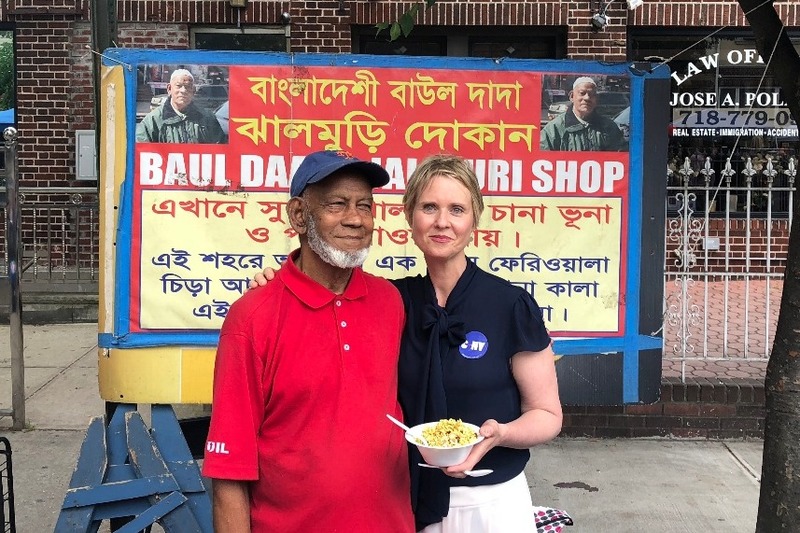 At the mela, New York state gubernatorial candidate, Cynthia Nixon stopped by his stall to taste his food, hear his singing, and learn about his story. Thanks to all of your support we are 35% to our fundraising goal for Jhal Muri Dada! We have some updates from Jhal Muri Dada. Because of some health issues he is currently receiving ongoing treatment for, he is now planning to return home at the end of December of this year. He has a medical exam scheduled for December 20th that would be too expensive for him to get back in Bangladesh. 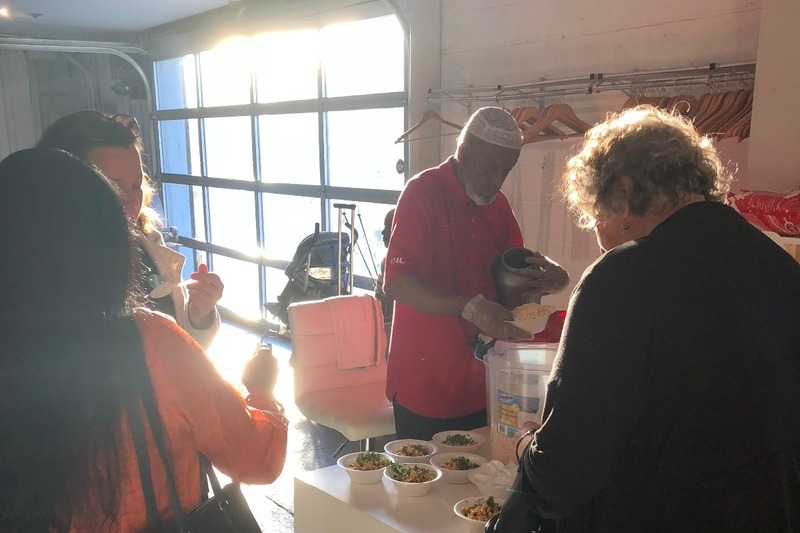 In addition to the health issues, he also has an ongoing case against the New York City Department of Health for throwing away his Jhal Muri Stand last year. His lawyer believes the case could possibly be settled sometime this year. 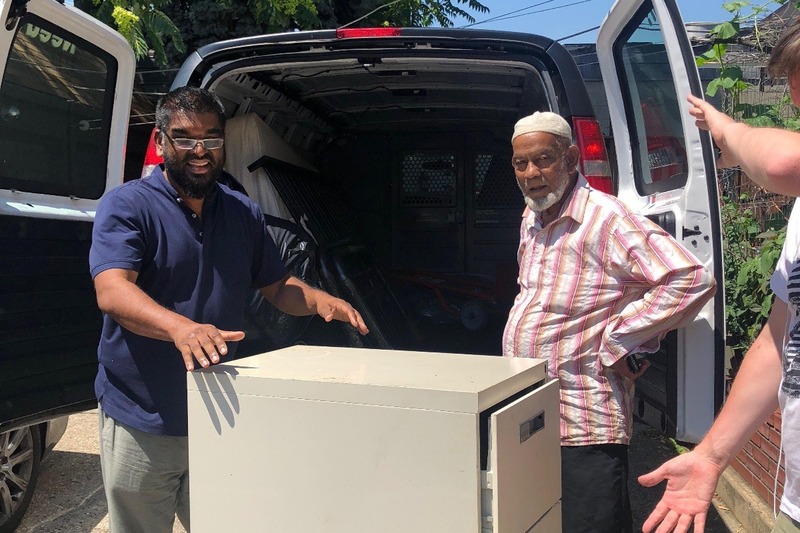 Lastly, with the Knights of Raj exhibit at the MOFAD approaching, Jhal Muri Dada and Mohammed Ali, the artist leading the exhibit, have started the process of placing Jhal Muri Dada's belongings at the exhibit including his jhal muri stand and home furniture. So please remember to check out the exhibit on July 21st and please share the gofundme page with your friends and family! Thank you!